To my mind there are a couple of contributing factors. 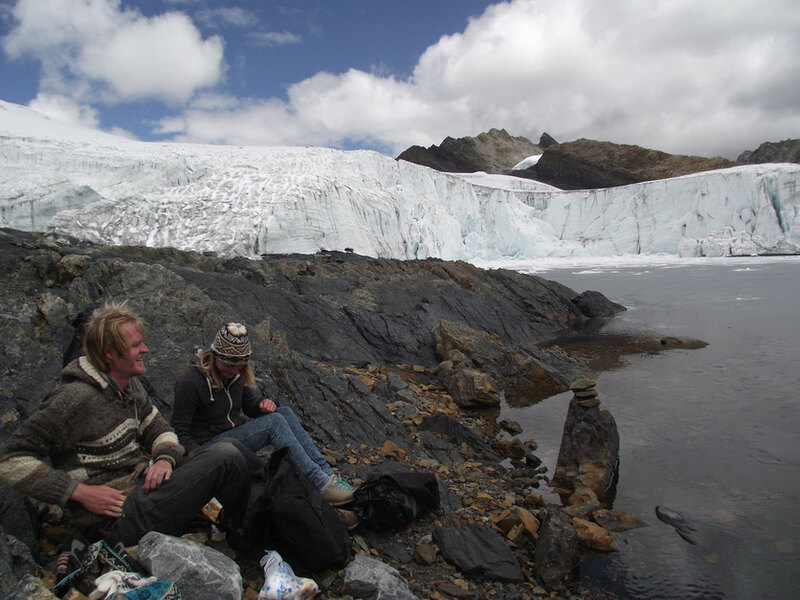 Firstly, Peru is one of the poorest countries in South America and the steady influx of rich foreign tourists has given desperate individuals plenty of time to conjure-up scams and other ways to take advantage. The second problem seems to be the attitudes of some tourists themselves- assuming they are invincible (as is often the way of backpackers) there is a tendency to ignore warnings and assume you are safe with the herd. I found this complacency in Thailand (an even more popular destination) too and a similarly high proportion of incidents. 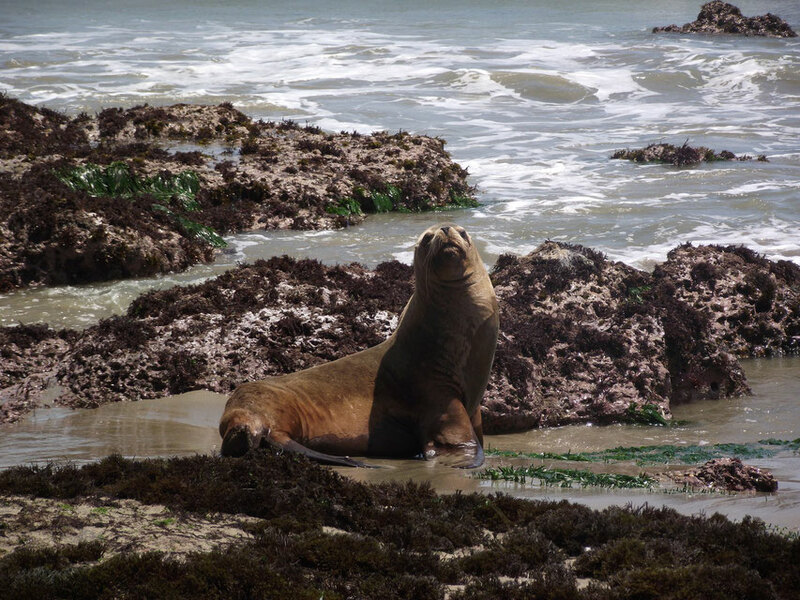 A proud sealion, Cabo Blanco, the Northern coast. The easiest way to avoid trouble when travelling is to blend in. Unfortunately, for two tall, blonde people like us, it wasn't often possible in Peru. Instead, mostly as a result of our low-cost simple lifestyle, our shoes were well worn, we wore very old clothes (often covered in paint from our volunteering work, with holes or some accidental mud) and I made a particular effort to ensure I was only ever showing a very conservative amount of skin. Although this isn't a glamorous way to travel, I honestly believe it was a huge part of the reason we avoided any trouble. Other than obviously hiding your valuables and being aware of your possessions at all times, my most effective way of avoiding pickpockets and scams is to simply limit my time in big cities. In smaller towns, there is less anonymity for thieves and it's unlikely that you'll end up in a crowd. Many of the scams I've heard of involve pick-pocketing too, so be cautious if you spontaneously bump into someone very friendly in the street. If you have a big camera, be sure to black out the branding with tape, avoid expensive, fancy looking hiking gear and only ever get your electronics out if you are comfortable with your company. 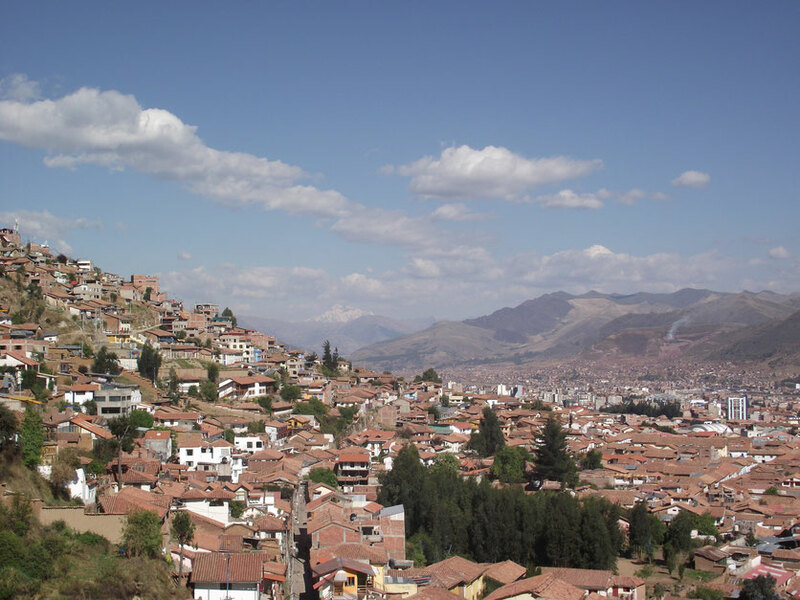 We heard stories of drug dealers and police working together in Cusco (and other places) to scam tourists out of large amounts of money. Some of the men selling paintings in the main plaza are drug dealers- "What's your favourite colour? Do you like white or green?". Avoid them! The main brunt of my safety fears in Peru came after our friends' express kidnapping and robbery from a dodgy taxi near Huanchaco. Huanchaco is a tourist beach town situated next to the third largest city in Peru and this I feel is the problem. Be much more careful in popular tourist destinations and big cities as the high influx of foreigners can create a profitable business for taxi drivers working with organised criminal gangs. I avoid taxis if at all possible (a bus is cheaper and safer in my opinion), but if you need to take one be sure that it's legitimate. If possible get a hostel, person working for the bus station or passing stranger to call or flag down a car. Even a dodgy taxi is unlikely to try anything if they think someone knows where you are going. Ask somebody how much the journey should cost and check with the driver before you get in- if it's too cheap walk away. Record the number plate, ask to see their licence and give these to somebody outside the taxi. You could also make a show of typing it into your phone. If you feel uneasy in the taxi make a fake phone call telling a 'friend' that you will see them at your destination soon. Ask the driver how long it will take to get there, so they are aware. 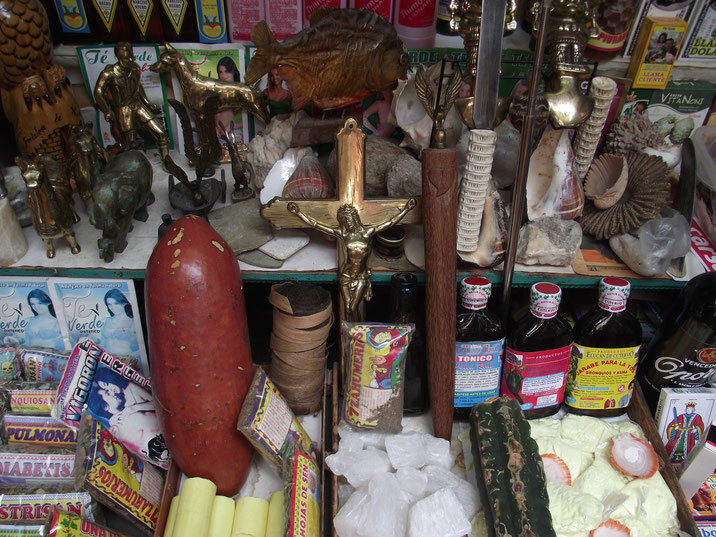 It's uncommon, but on certain routes in Peru there is a potential risk of road blockades and highway robberies. Check your route online before you travel and if there have been incidents, see how common it the problem is. If possible avoid travelling at night on potentially risky routes and if you must try and choose a direct, reputable bus company. Certain roads, such as those around Tingo Maria and some places near the borders, are notoriously dangerous and should only be travelled by people aware of the risks. Personally I would probably avoid them unless I had a real reason to go. On any bus keep your valuables on your person, avoid using overhead racks and consider hiding your documentation and money under your clothes. If you are a girl travelling alone, it might be better to select a woman already on the bus to sit next to rather than risk a pervy companion. 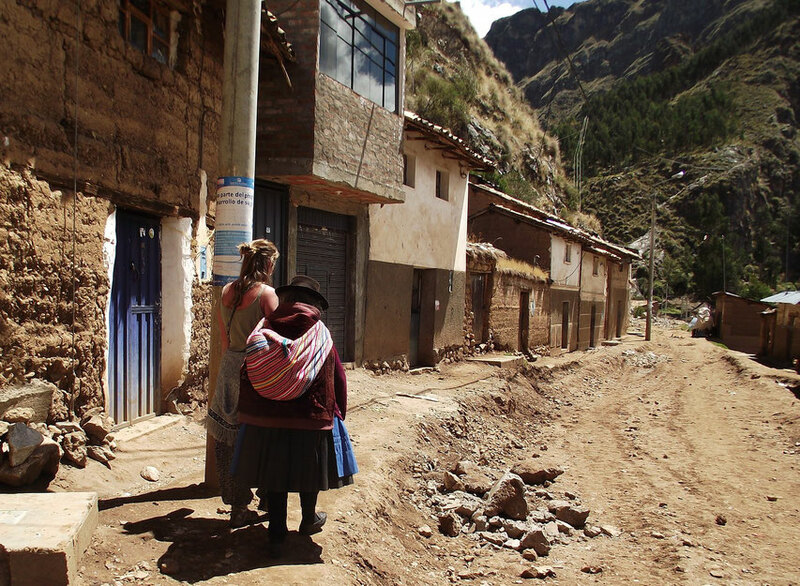 Our friend Coraline befriended by a local indigenous lady, Huancavelica, Central Highlands. For women- annoying men through to sexual assault. Luckily I didn't hear of any sexual assaults in Peru, but the advice is mostly the same as anywhere. It applies to both genders, but as a woman I know I am especially careful to avoid walking anywhere alone at night. Make friends from your accommodation to eat with, buy dinner early or try to stay close if you want to go out alone. If you are catching a night bus get there early and sit in the station. If you arrive before sunrise try and stay inside until it's light or find a well-lit place to wait. I also usually wore baggy clothes, though this was more to save my own sanity and reduce unwanted attention. Peru is a conservative country- save shorts for the beach, don't get your cleavage out or wear see-through tops. I also never wore make-up. I am wholly against victim blaming for sexual assault, but be aware of cultural attitudes towards women and how you can make your own life easier. Women should be aware that even placid seeming local men can become a bit unmanageable with alcohol. Be sure of your friends or stay in large groups at parties. Any amount of flirting can be read as a direct come-on and it might be difficult to explain (in dodgy Spanish) that you don't want anything more. Minimising your time in big cities will help avoid violent assaults. Don't be scared, just more aware of your surroundings in these places. Driving and road standards are notoriously bad in much of South America. This is one danger that it is difficult to avoid altogether, but you can reduce it by travelling in the daytime and trying to avoid mountain roads when the weather is bad. If you are hitchhiking do so in pairs and use your instincts. We hitchhiked for a few days through the desert in the North, but found it very slow. 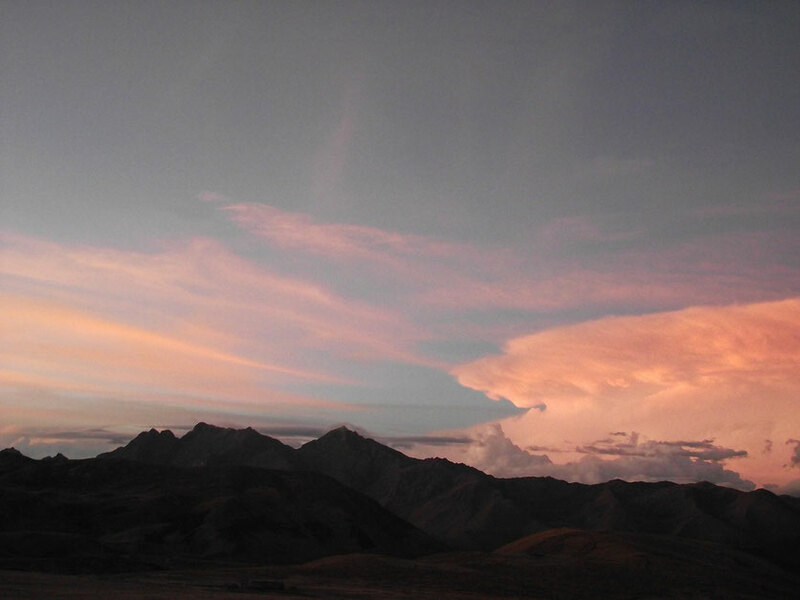 Sunset over the mountains on the long road between Ayacucho and Cusco, Central Highlands. For some reason we found the dogs in Peru to be particularly aggressive, especially in rural areas where they probably interpreted our foreignness as some kind of threat. Ignore barking, but if they are getting close and you are worried about being bitten it's usually possible to keep them away by shouting in a low pitched commanding voice, threatening them with a stick or throwing stones. I've never had to hurt a dog to make it go away, so try not to actually hit them. It's more about trying to scare them while you have time to back away. Don't ever run! 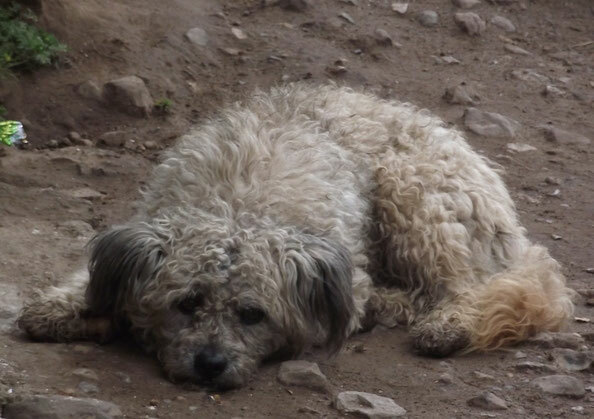 A docile dog in Huancavelica. Be aware that regulations are not as strict as in some other parts of the world. Just because there isn't a sign telling you not to do something it doesn't mean it is safe. You cannot trust electrics and be careful of anywhere where building work is going on. Don't assume there are lifeguards on the beach, or that they will save you if you get stuck in a rip tide. Don't annoy wild animals, especially snakes and spiders... Watch your feet and if walking through long grass hit the ground with a stick in front of you. If you see a snake back away slowly and walk around it. If you are lucky enough to find a warm shower in cheap accommodation it's likely to be electric. Be careful as the wiring is often faulty and avoid touching the shower head or anything that might give you a shock with a wet hand. Thermal springs (not for swimming!) 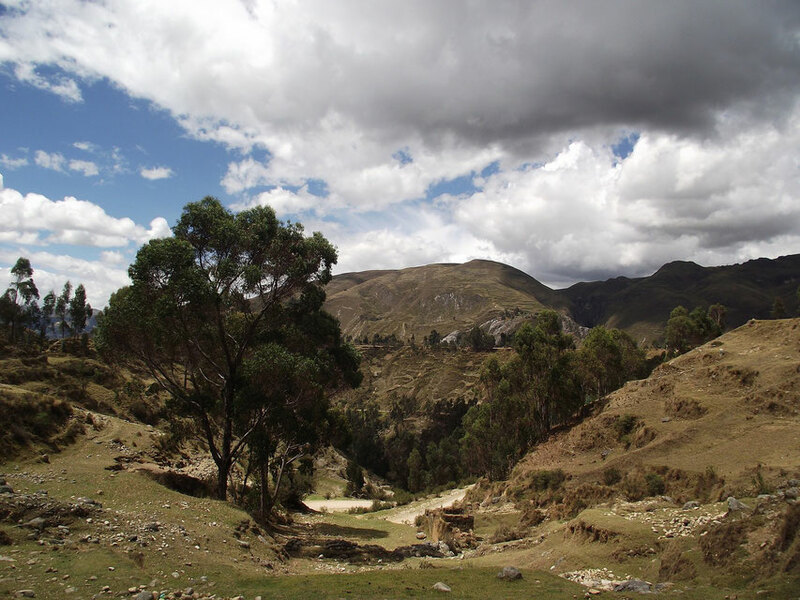 near Huaraz. Check what vaccinations you need well in advance! Have a well stocked first aid kit- a broad spectrum antibiotic, diarrhea tablets, antiseptic and antihistamine are all very useful as well as all the usual things. Take extra, as you might end up giving a lot away to new friends. If you need extra medicine it is possible to buy almost anything over the counter. Explain your problem and they should sell you something. It is advisable to google the drug before taking it. Wash or preferably peel fruit and vegetables and cook everything thoroughly. Be extra careful with raw meat as it often isn't refrigerated. Trust your nose and don't be afraid to throw away food that doesn't taste right. Little heads up- Dan got sick from a Mr Whippy type icecream in Huancavelica- we suspect it was made with river water- watch out for that! Never drink tap water in cities. Sometimes it is OK in the mountains, but be sure to ask a couple of people first. Water sterilising tablets can be very useful for walking, but be aware that if there is a village upstream there may be chemicals in the rivers. Give yourself some time to adjust before doing any hiking. A good few days if you have come from the coast. Try coca-tea which the locals swear by. Wash your hands before you eat or don't touch your food. Take extra care of your teeth as going to the dentist may be risky and/or expensive. Look after your feet too- some anti-fungal powder might come in handy if you are wearing the same shoes for months. Taller people will be unable to find new shoes to fit. If your possessions catch fleas or bedbugs, wash and hang everything out in the sun. Tea-tree oil is great. A couple of drops in water can be used to disinfect anything, you can spot it on your bedding/shoes to ward away bacteria, fungi and parasites or even put a little on a bad tooth to kill some of the infection. 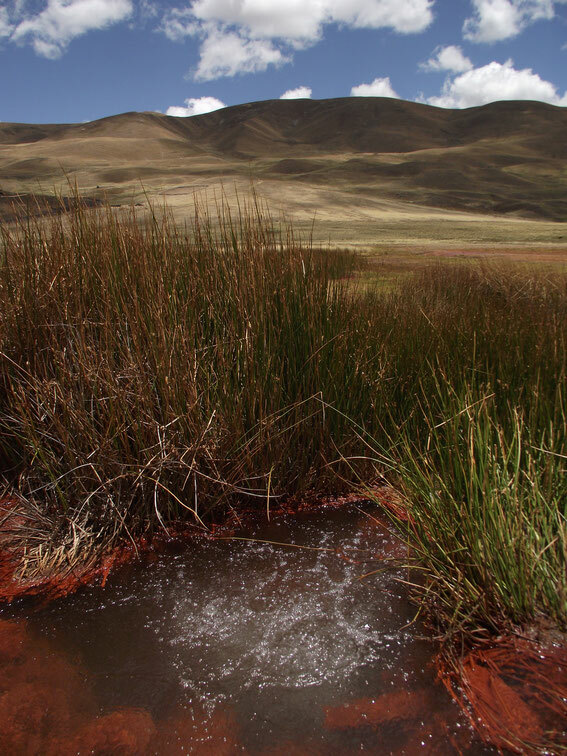 Through doing a little research and being aware of our surroundings, we didn't have any problems in Peru. Maybe it was luck, but if you follow this advice I think you will stay safe and have an amazing experience. Mountains around La Union, Central Highlands. *Port of Spain, the capital of Trinidad and Tobago, is known to have had exceptionally high murder rates. Cabo Blanco- a safe haven after hitchhiking through the desert.